Boost Oxygen is so Lightweight and Portable! While at-altitude, Kanye had a bottle of Boost in-hand. Khloe trusts Boost Oxygen to fuel her workouts. MILFORD, CT, UNITED STATES, January 12, 2019 /EINPresswire.com/ — Typically, a product must pay exorbitant endorsement fees to be in the hands of high-profile individuals who have ‘celebrity’ status. Boost Oxygen, however, has always been very fortunate to enjoy organic adoption based primarily on efficacy and trust, most recently with the Kardashian clan. 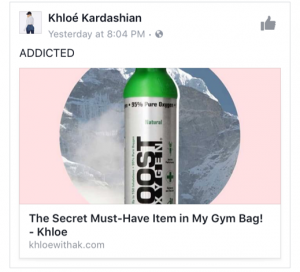 Without any contact, Khloe Kardashian posts on her Facebook page that Boost is a ‘must have’ for her gym bag – showing a picture of the bottle. 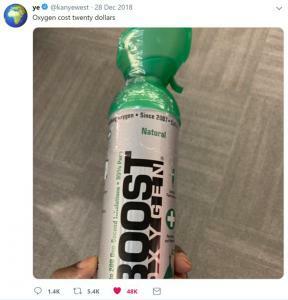 While on a family trip to Aspen, Colorado, Kanye West tweets a picture of him having a bottle of Boost Oxygen in-hand. The Kardashian clan were recently photographed by the UK’s Daily Mail while vacationing in Aspen with a bottle of Boost being clearly visible. One would think the popular supplemental oxygen product has contracted with the Kardashians to endorse, or, they have a vested financial interest in the company. The use of supplemental oxygen is not a recent phenomenon or a fad. It’s all-natural, safe for all ages and has been helping people around the world for decades who have had special access to it (hospitals, ambulances, doctors, nurses, EMT, fire fighters, pilots, etc). What Boost Oxygen does is to provide easy access for everyone – in an affordable and non-prescription form. Other celebrities who have discovered Boost Oxygen, and have been seen with it or shared about it in traditional and social media, include: Simon Cowell (during a feature on NBC’s ‘Today’), Rob Lowe, Brie Larsen, Reba McEntire, Journey (Rock and Roll Hall of Fame members), Meatloaf, Randy Houser, Ryan Seacrest (during the Final Season of American Idol), Lala Kent and the guys from Vanderpump Rules, Grant Cardone (best-selling author and world’s #1 sales trainer), and the incomparable Howie Mandel. Boost Oxygen is also very proud to be trusted to support the talent and passion of professional teams and athletes across all sports; these are people who thoroughly vet any product they implement. Boost Oxygen CEO and Co-Founder Rob Neuner and his daughter Kelly appear on TV8 Vail's 'Good Morning Vail' program.